(Lancaster, Pa., June 28, 2016) - Last year, they won their divisions. This year, they get the honor of managing in the All-Star Game. Brett Jodie, manager of the defending Atlantic League champion Somerset Patriots, will once again match his wits against Stan Cliburn, who led the Southern Maryland Blue Crabs to the Freedom Division title in 2015. 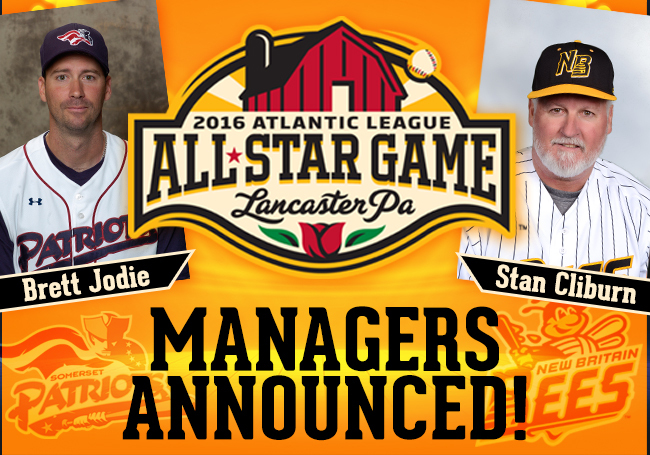 They will meet up at the 2016 Atlantic League All-Star Game and Farm Show, to be held at Clipper Magazine Stadium in Lancaster, Wednesday, July 13. Jodie, 39, took the helm of the Patriots in 2013, replacing the legendary Sparky Lyle, under whom he had played from 2003-05 and coached from 2006-12. The native of Lexington, SC has reached the playoffs in all three of his seasons as Somerset’s manager, but did not win his first title until last season when he defeated Cliburn’s Blue Crabs for the title, the sixth in Somerset franchise history. The former pitcher, who faced the Lancaster Barnstormers in the first game in the host franchise’s history, became the fastest manager to reach 250 wins in league history, reaching that milestone on August 26 of last season. He will be joined on the Liberty Division coaching staff by the remainder of the Patriots coaching staff, which includes hitting coach Glen Barker, pitching coach Cory Domel, and bench coach Fox Beyer. Cliburn, who moved on to manage the league’s new franchise in New Britain this season, will cross back over to the Freedom Division for this special event and manage against his own current players in the game. The long-time manager in the Minnesota Twins farm system first came to the Atlantic League in 2014 as the hitting coach in Lancaster but returned to managerial duties in 2015 with the Blue Crabs. His Southern Maryland squad won that division’s first half and went on to take down the second half champion Barnstormers in four games in the Freedom Division series. Cliburn, 59, a one-time catcher for the California Angels, has piloted teams in the Pittsburgh, Texas and Minnesota systems for a total of 16 seasons. He has also run clubs in the Texas-Louisiana League and the American Association. Last year, the Blue Crabs celebrated the 1,500th win in Cliburn’s storied managerial career. Joining Cliburn on the Freedom Division coaching squad will be three coaches from the host Barnstormers. Rich Rundles, the pitching coach for the Barnstormers, will serve in the same capacity in the All-Star Game as will bench coach Ross Peeples and base coach Daisuke Yoshida.